I loved the Beatles as a teenager -- still do! How can we forget those psychedelic lyrics! Whenever strawberry season is on, I find myself humming those lyrics to myself frequently. 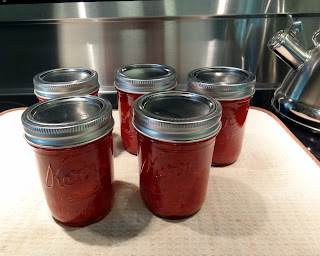 This year while humming them I decided to make strawberry freezer jam! Our local grower has these wonderful, just picked, washed and cleaned buckets of strawberries, which really makes the job go fast! The few extra dollars we spend on this is well worth the extra time gained for sewing or fly fishing or working in the garden. It's so simple that I decided to show you. I buy these packets of no cook freezer jam. All you do is add a cup and a half of sugar. 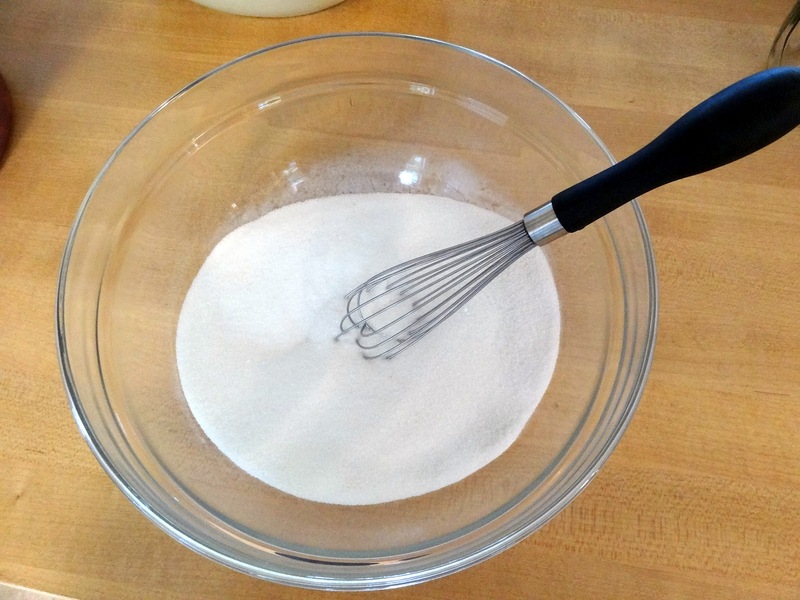 Whisk together the sugar and jam mix. Crush enough strawberries to make four cups. I use my trusty, years old potato masher, but I suppose you could also do this in your food processor. If you're using the potato masher, a flat bottom bowl makes it much easier. 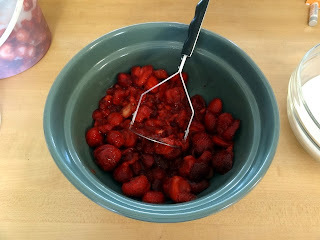 Stir the crushed strawberries into the sugar and pectin mix and continue stirring for 3 minutes. Ladle the jam into clean jars, place lids on and freeze for up to a year. It also keeps in the fridge for about 3 weeks. I got five, half-pint jars from one package and repeated this twice more for 15 jars! Some of you have emailed and asked about Sophie and Sugar. 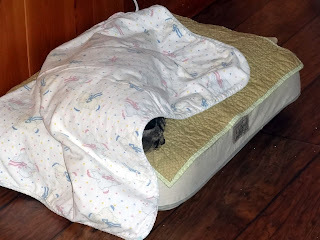 This has been Sophie's cocoon for some time now. Not only does she like to be covered with her baby blanket, she is sleeping on top of a heated bed! Our old girl really knows how to live! I suspect her old bones feel really good with all the heat. This is Sugar in the mornings outside. Notice how the white hair on her face forms a pyramid? She and I are on again and off again buddies. If I do anything like brush her or wipe her eyes, she hides from me for days and we have to start the trust process all over again! 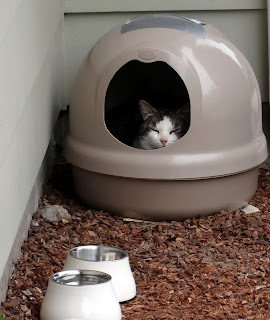 She's gotten very territorial with the yard, though, so we're sure she considers us as her permanent home now. Next post I'll actually have a quilt finish to show you! While making jam did you have marmalade skies? That looks amazing. I think I'll get a flat of berries and freeze some jam...when the "dust" settles. Your critters are adorable. Your freezer jam looks yummy. We replanted our strawberries this year, so next we should have berries again. Glad both kitties are doing well! Excellent way of making jam. Here we can get tins of prepared oranges for marmalade. I can deal with that! I'm onto elderflower cordial now- steeping overnight before bottling. The champagne is bottled. Off to sew now. I'm on my way over to spread some of your jam on my English muffin. Have the coffee ready! How nice to have cleaned and prepared strawberries! I stood over the sink for what seemed like an hour yesterday washing, coring, and slicing 4 double baskets for strawberry shortcake. Your kitties look satisfied with their lot! Sorry the shy girl is slow to warm up--she is really cute. 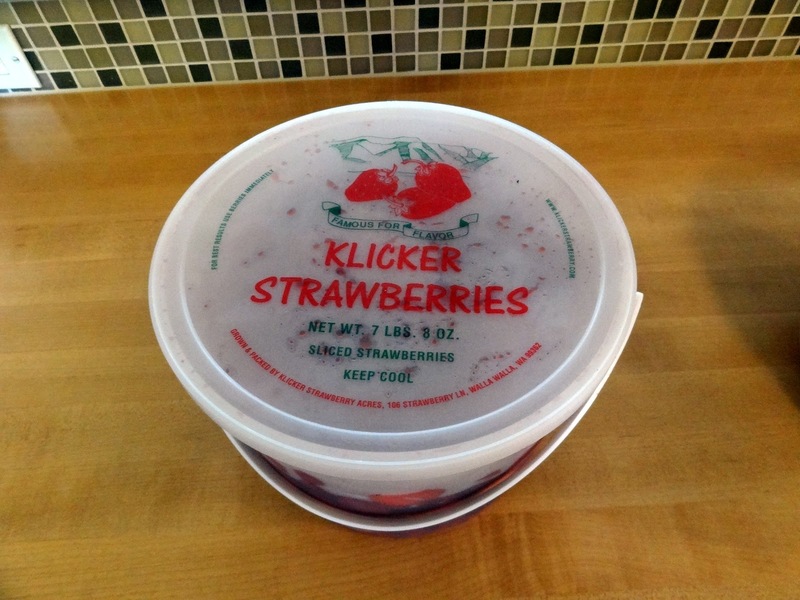 Freezer jam is fun to make especially in this area with the numerous upick berry fields! We are still waiting patiently for sunshine and warmth! 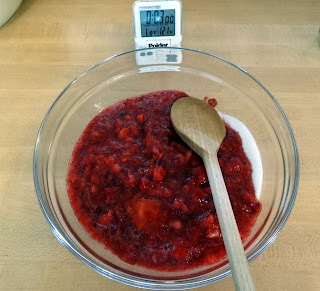 I made "no fail" strawberry freezer jam over the weekend and it is so runny, it's syrup. Followed the recipe to the "T" and it's just not firming up. Used Sure Gel---followed a recipe posted from Six Sister's Stuff that has been made for 'years' supposedly with no fail. I hate to dump it all down the disposal but I am so frustrated. I often have too soft jam making the freezer jam recipe on the box (using the regular Sure Gel or the one specifically for freezing) and I cannot figure out what I am doing wrong. I have never seen Mrs Wages pectin. I tried some online research last night for how to fix it and may try a do-over. I am wondering if lemon juice from a bottle or fresh lemon juice would make a difference. I use fresh lemons. Do you always have success with the Mrs Wages? I made some blueberry freezer jam. Just as easy and so good. I didn't realize that freezer jam doesn't require cooking. How much easier is that!!! I bought a flat of strawberries at our local farmer's market this past weekend and froze half of them with the intention of making some jam probably in the fall. 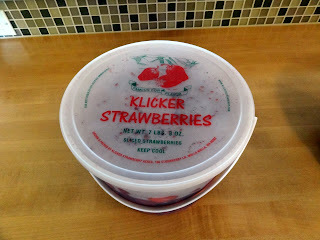 Maybe I'll buy more this weekend and make some freezer jam. So much less work than the stove top type. Love the kitties. They just melt my heart. 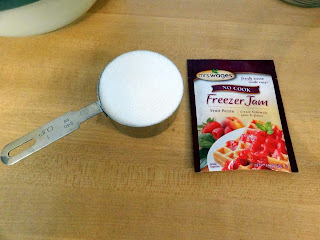 I love freezer jam and used to make it all the time when we were in Calif. You brought back memories. Love the kitty pictures. So cute. Sugar looks so happy in her little home, I'm glad she picked you. I made a strawberry/rhubarb crisp this weekend. Wringer Washer Finish and Baking!